LYNCHBURG, Va. — The president of what is purportedly the largest Christian university in the world remains unremorseful after concerns were raised over the spirit of his comments about “ending Muslims” that he made to students and faculty at a convocation on Friday, which also drew applause from those gathered. 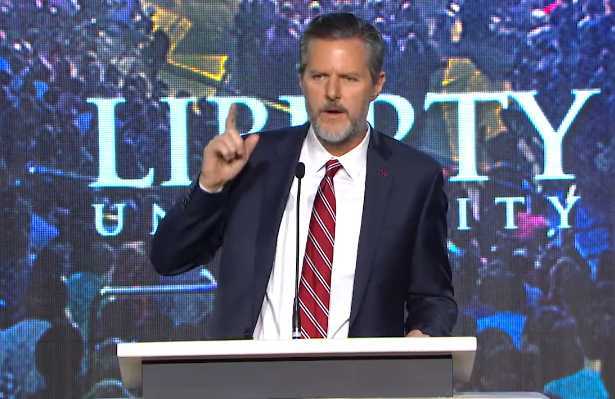 “I’ve always thought, if more good people had concealed carry permits, then we could end those Muslims before they walked in and killed them,” Jerry Falwell, Jr. said on Friday to unreserved applause in speaking about Wednesday’s San Bernardino massacre. The thousands present again applauded enthusiastically and cheered, with some smiling wide and one man in view of the camera giving the remarks a standing ovation. Falwell told the Washington Post that his comments resulted in the most positive feedback he has ever received for a convocation. “The support here on campus is almost universal,” he stated. He went on to reTweet social media posts in support of his remarks, including one that read, “S*CK IT, Muslim extremists,” adding a link to the school’s gun course. The account of the original Tweeter is now unavailable. However, when some became aware of Falwell’s statements, they expressed concern about the spirit of his statements in killing Muslims. Some online commenters, while supporting the Second Amendment, also disagreed with how Falwell expressed his views. “I think Falwell has made the situation more tense rather than less tense by his choice of language,” one wrote. Falwell told reporters that he doesn’t regret his statements per se, but would have inserted the word “extremists” to clarify. “If I had to say what I said again, I’d say exactly the same thing,” he said.